Hi! Today we start a new series of posts in which we will see details of memory allocation in .NET. 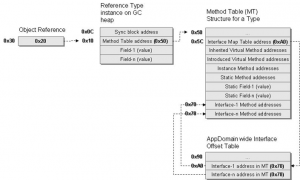 In this part we will allocate managed object of reference type on a stack. Let’s go! It is a common interview question: where are stored value types and where are stored reference types in .NET. Common answer says that value types are stored on the stack whereas reference types are stored on the heap. More inquiring recruiter might ask: what happens with value types inside reference types, and should hear that they are stored on the heap as well (since they are part of the reference type). However, is it possible to store reference type on a stack? These questions are odd. First, there is no hard definition of stack and heap in .NET standard, so asking about it pointless. However, without this knowledge it might be hard to track memory problems in real applications so it is worth knowing the internal implementation. So in order to ask these questions correctly, we should specify the version of the .NET we are talking about, processor architecture, operating system, and so on. Only doing that the question makes sense. So let’s do that. Let’s assume that we have Microsoft .NET Framework 4.5 version 4.5.50709 and Windows 10 x64 running on Intel Core i7-4700 processor. Is it possible to allocate reference type on a stack using application compiled as Any CPU? And the answer is: it depends. It depends on what do we understand by “allocate”. If we simply mean that we want to have an object on a stack, than the answer is “yes”. If we want CLR to call constructor and initialize object in a place which we specify, then answer is still “yes”. If we want to do that without unsafe, marshalling, and not especially clean hacks, then the answer is “no”. So it is up to you which answer you choose. Today we are going to copy existing object from a heap to a stack. In one of the next parts we will see how to modify CLR in runtime in order to hijack the allocation mechanism and be able to implement allocator in C#. Let’s start. So there are three important parts of allocation. First, we allocates some memory and set its content to zeros (the latter is done by the operating system usually). Next, we call the constructor so the object has an opportunity to initialize itself. Finally, we store reference to the object on a stack. Since we will be mangling with the memory, let’s leave the high-level nomenclature and call it a pointer (yes, old and dirty pointer like in C++ language). Let’s see how objects are stored internally. Pointer points directly to the object memory so we are basically not able to tell anything about it without knowing its type. As a side note: this also explains why we need to specify method table address when using !dumpvc command in WinDBG. As we can see, pointer points to the thing called Method table address. This is a pointer point to the Method table, which describes the object. It contains all the information about methods, fields, inheritance hierarchy etc so we are able to inspect the object with reflection. After the method table address there are fields of the object. It is also important, that the object does not contain any methods. Object is just a bunch of fields, all of the other stuff is stored somewhere else. From the internal point of view, all instance methods are static and they accept one additional parameter: pointer to the object. It is also worth noting that there is a thing before the object called Sync block address. This is used to lock objects with lock construct. Now our task is a bit more clear: in order to copy object, we need to know its size, copy all the fields, sync block address, and method table address. This should allow use to do all the things we would like to do. So we basically have a bunch of bytes and a pointer to it (called reference in .NET language), then we have Typed reference pointing to reference, and finally we have an IntPtr pointing to Typed reference. Since we end up with pointer to integer, we can dereference it a few times and get a direct access to the object. Having that, we will be able to copy memory to the stack. In order to use the object, we will need to create a reference to it, and here is the time when we use __refvalue keyword. To sum up: we allocate the object on a heap. We allocate some memory on a stack (using stackalloc keyword or simply by allocating a structure with a few integers). Next, we get a pointer to pointer to pointer to object and copy it’s content to the stack. We need to store method table address so the object will be recognizable for .NET, we also need a sync block pointer in order to be able to lock the object. Finally, we create a reference to the object and we are done. We simply define a structure with one integer, one non-virtual method (WriteField), one virtual method (ToString), and a destructor (or rather finalizer). Next, dump the memory on a stack with dd and observe that indeed we have bad food on a stack. We create a TypedReference using mentioned keyword. Next, we get an address of it, then we cast it to int pointer (so we have a pointer to TypedReference to reference to object), we dereference it and cast it to int pointer (so we have a pointer to reference to object), dereference it (so we have an address of an object), finally we subtract 4 (so we point to the sync block) and cast it to the int pointer. Remember, that we compile as AnyCPU, so we basically run as x86 and the pointer has four bytes. You can verify that we have a correct pointer with WinDBG (by dumping the object from the heap). We need to copy exactly three integers (sync block, method table pointer, one field). You can now verify that we wrote some bytes on the stack (remember the bad food pattern?). We now have our object on the stack. Let’s create a reference to it. We take our TypedReference, once again gets its address, dereference it a few times and cast to int pointers. We do all these things just to get a pointer to the reference pointing to the object on a heap and modify it. Now, our reference points to object on the stack. We did not modify the object, we modified the pointer (reference) pointing to it! Finally, we create a reference from TypedReference. You should get the same two values (five in both cases) since we copied the object. Now you should get two different values. You can also try to register object for finalization — its destructor should be called when the next collection occurs. However, please don’t do that! Cool. You can see the whole code here. As we can see, it is possible to allocate object on a stack. In the next part we will examine this idea to implement list which stores objects instead of references to them. Stay tuned.